Princess Alice Highway runs in a straight line from the cruise terminal into Bridgetown. However, at Prince Arthur Street, you have to make a decision. If you turn left and proceed over a few blocks you come to Bridgetown's main shopping area, Broad Street. There you will find Cave Shepard's, the largest department store on the island, Woolworth's and various familiar cruise port chain stores like Diamonds International and Little Switzerland. If you go right, you soon come to the beginning of the Boardwalk. This pedestrian-only route runs along the Careenage, the body of water that juts into Bridgetown from the sea. In the 18th century sailing ships were brought here for repair. A ship would be run aground and turned on its side so that work could be done on the bottom of the hull. Today, you still see ships in the Careenage but they are yachts and tour boats moored in its tranquil waters. The Boardwalk is a nicely done path, which lends the area a polished, upmarket look. Below: Yachts and pleasure boats in the Careenage. Regardless of whether you go south on Broad Street or east along the Boardwalk, you soon come to the heart of Bridgetown, Heroes Square. The centerpiece of the Square is a statue of Admiral Lord Horatio Nelson, who defeated the combined French and Spanish fleets at the Battle of Trafalgar in 1805. This gave Britain supremacy at sea for more than a century and so was a very important event in the annals of the British Empire, which, of course, once included Barbados. The Square was called Trafalgar Square until 1999 when it was decided to rename it to honor all of Barbados' heroes. Inasmuch as the Square is also the location of the Centotaph in memory of those Barbadians who died in the World Wars, the decision to rename the Square was clearly appropriate. Bordering Heroes Square are the Barbados Parliament buildings. Barbados has the third oldest parliament in the Western Hemisphere. These buildings also house the Museum of Parliament. Not far from here are the beaches of Carlisle Bay. To get to them, you have to cross over the Careenage. The Chamberlain Bridge is a pedestrian bridge just to the south of Heroes Square. It is immediately recognizable because at its far end is a triumphal arch called Independence Arch. Once you go through the arch, you come to Bay Street. Following along this not particularly attractive street, you eventually come to a series of bars and restaurants that have facilities on Browne's Beach such as the popular Boatyard, Harbour Lights and Lobster Alive. 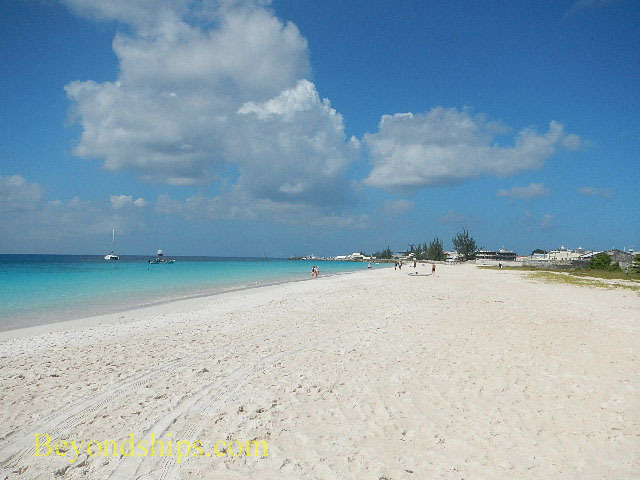 All beaches in Barbados are public and thus you do not have to go through any private establishment to go to the beach. Of course, you cannot just trespass across someone's property to get to a beach but there are signs indicating public access ways. Another way to get to the beaches is to take the automobile bridge at Bridge Street, which turns into Probyn Street on the other side of the Carrenage. Passing the fire house and the ruins of the old Empire Theater, Probyn Street runs into Bay Street. This is a longer but busier route. Walking to Bridgetown is relatively easy. Quite a few passengers and crew members make such a journey. 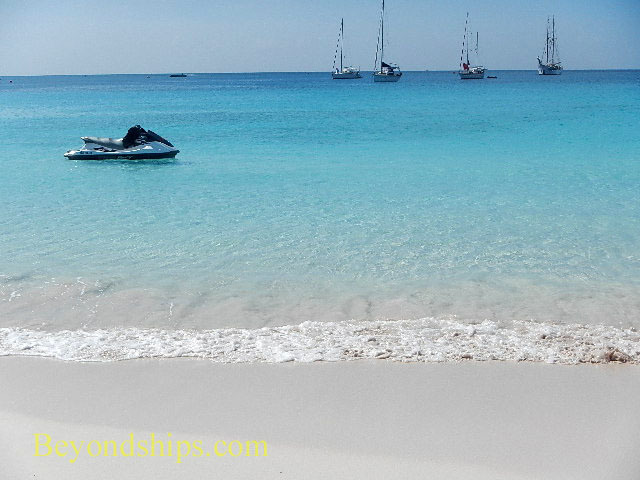 However, most passengers go further a field during their time in Barbados. 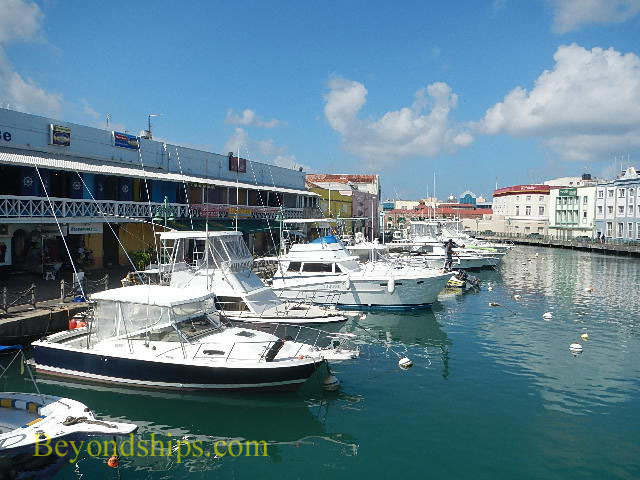 Bridgetown is still developing as a tourist center and so there is not as much shopping as in ports such as St. Thomas or St. Maarten. 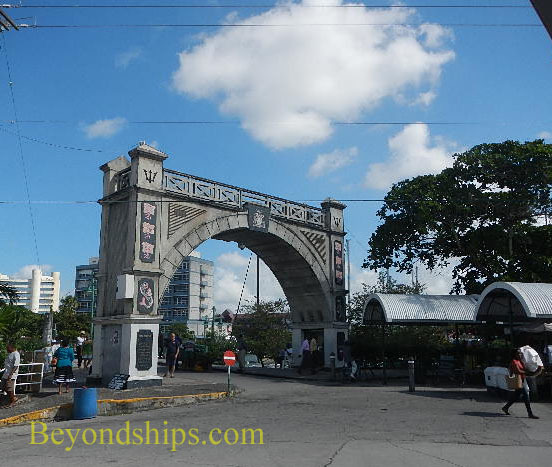 Along the same lines, it does not take long to see Bridgetown's tourist sights. It has some pretty sections and some that are less interesting. As in any urban setting, one should be vigilant while walking around but most people are polite and we had less encounters with aggressive street vendors here than in some other Caribbean ports. Below: Browne's Beach on Carlisle Bay.